(1) Mt. Walla, built around 1770 by John Scott high on the bluff overlooking Scottsville. It was acquired in 1836 by Peter Field Jefferson, grandnephew of President Thomas Jefferson. 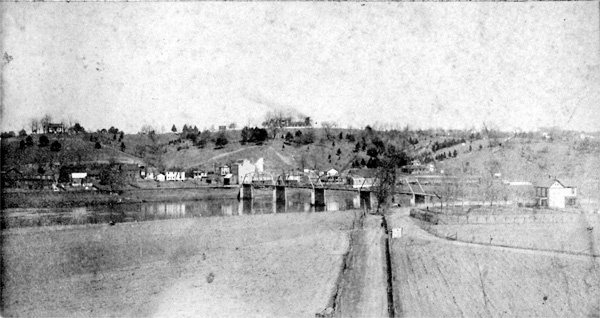 (2) Riverview, built by Littleberry Moon after his 1812 marriage to Sallie Price Perkins. Moon was a wealthy Scottsville merchant and probably had his office in the early brick wing of the old house. (3) Scottsville Flour Mills, built in 1910 when several townsmen pooled their money to construct this business with a daily production capacity of 125 barrels. Arthur Louis Thacker, Mayor Thacker's father, came from Stuart's Draft, Virginia, to manage this mill until 1917. 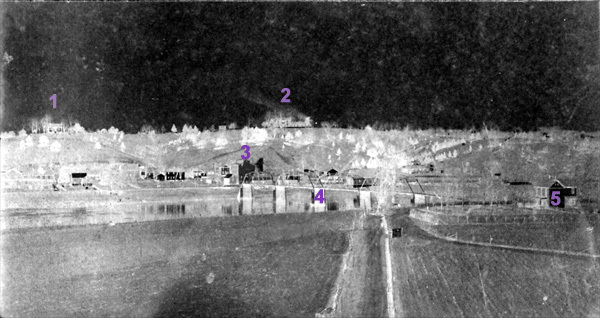 (4) Scottsville Bridge over the James River, built in 1907. (5) Mr. Seay's home in Buckingham, Co. Seay always had a wonderful watermelon patch, frequently raided by watermelon-loving Scottsville boys.